Swiss Made Fruit And Vegetable Peeler. Super Sharp Blade With Ultra Light Frame. Blazing speed and incredible accuracy set this tool apart from the rest. Nearly identical to the regular Star Peeler, this Rapid version has the same blade, but with a much lighter frame. Overall sizing remains the same so it will be just as comfortable to hold, and easy to use, but the reduced weight can dramatically improve peeling speed for some users. A high quality steel is used to manufacture the blade, and it is hardened to reduce wear and increase sharpness. No pressure is required to peel off the thin outer layer, but when pressure is applied, you will be able to remove thicker slices if desired. The wide grip is ideal for anyone with arthritis, but loved by all due to the comfort. Thanks to the design, it is just as easy to use for right or left handed people, and the light weight reduces strain over long periods. Use on any fruit or vegetable in your fridge because the razor sharp blade will conform to any surface, and slice through any type of food. An integrated loop on the side makes the perfect tool to quickly remove imperfections from potatoes without slowing down. Made in Switzerland. Better materials and higher quality construction ensures a powerful tool that lasts a long time. Lightweight construction. Super sturdy ABS plastic handle is much lighter than metal versions, but nearly as strong. Incredibly sharp blade. Hardened steel is sharpened to a razor-like edge that slides through veggies like butter. Wide handle. The fatter grip is more comfortable in anyone's hands, and it is ideal for those with strength problems or arthritis. Left or right handed. Operation is totally ambidextrous, so literally anyone can use it with ease. Integrated cutter. A loop on the top side quickly digs out brown spots, but can also be used to shred stuff, or cut strips. Pressure sensitive. Glide over skins to take off the top layer, or press down to remove a thicker piece. This tool can thinly slice or cut wide, thick slices. Dishwasher safe. Cleaning is easy because hand washing is not required. Prefer a tool with all metal parts? The original Star Peeler has an identical size, shape and blade, but it comes with a stainless steel handle instead of plastic. We also carry a Julienne Version and Serrated Version by the same manufacturer, so be sure to check out those if you need a specialized edge. Want all three cut types? Then check out the 3 Piece Set. It comes with three stainless steel peelers, each with a different blade. Thanks to the blade quality, this peeler works well on just about any fruit or vegetable out there. Use it on hard or soft foods with any skin type, shape or size. It even works well for slicing cheese or grating chocolate. Get one to have the best way to peel apples and potatoes, but then pull it out for other tasks because it quickly become a go to tool. The pivoting blade conforms to any surface, and it removes wide thin strips with every pass. Get lightning fast speed when cutting cheese for a snack, shredding cabbage for a salad, or just taking the skin off a carrot. Operation is pretty simple, but you do want to follow the simple steps below for ideal results. Hold the peeler with either hand. Indentations on either side make the perfect grip points, and create a comfortable handle. The fatter sizing allows for a more relaxed hold without compromising control. To peel, position the tool with the blade on top, and then lay flat against your food. For regular paring and skinning, use extremely light pressure. For thicker shreds or slices, press down as you move the tool. Thickness will adjust according to how hard you press. Pull back to peel. Use long, continuous strokes, and move along the full length of the food. It will remove long wide pieces, and it will slice through any food quickly and easily. To cut strips or remove yucky spots, turn to the side and use the loop to dig them out, or cut. Hand wash or place in dishwasher for cleaning. Apply vegetable oil occasionally to protect the blade and ensure longevity. Blade Material Hardened Steel (Tungsten) Incredibly sharp and long lasting. Dishwasher Safe Yes - For best results, and maximum longevity, always dry blade prior to storage, and occasionally oil to prevent rust. Peel vegetables with lightning speed. A ridiculously sharp blade is paired with a super light frame. Get incredible control as you quickly remove skin, slice cheese, or shred chocolate. Order Yours Today. 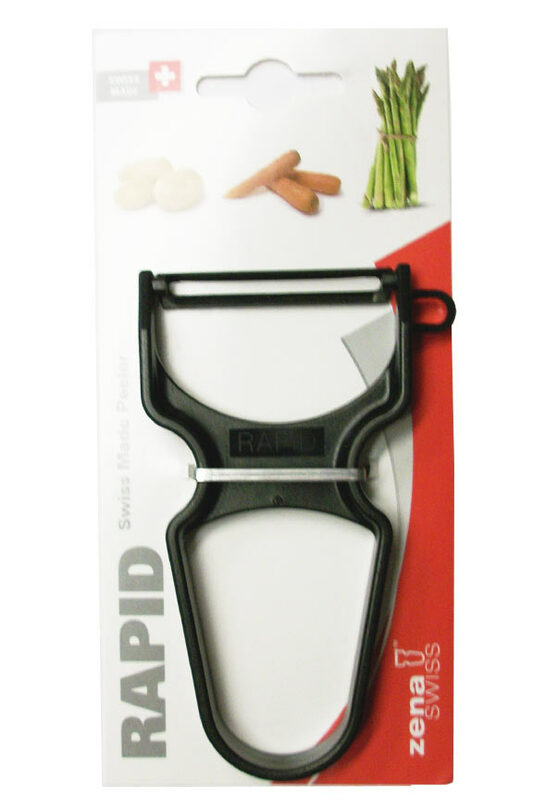 I absolutely love this Rapid Peeler. 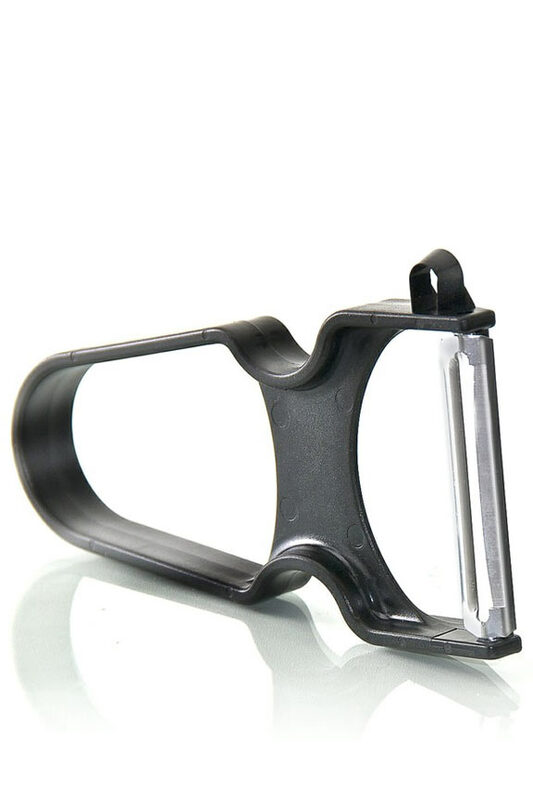 I've had a similar peeler to this one and this one is so much sharper. This vegetable peeler does an excellent job, including winter squash and fresh ginger. order one of these as I had one before, put it in my camper. Now I have one for my S/B home.. So happy and for those who have never used one you don't know what you are missing, easy on the hands. no cramping. I bought this peeler because I have arthritis in my hands and it is painful to use conventional peeler. This one is wonderful - no pressure on my most sensitive finger. I love it. The peeler is awesome. Peeled 4 bushels of apples with it two days after I received it, and many pecks of potatoes since. It is easy to hold without cramping my hand. Best peeler I've ever owned, bar none! Three Great Peelers in One Convenient Package. High Quality Stainless Steel Vegetable Peeler Set. A Convenient and Efficient Fruit & Vegetable Peeler by Zena. A Vegetable Peeler With Serrated Blade by Zena. The Ultimate Vegetable Peeler. Swiss Made Quality by Zena. A Serrated Blade Fruit And Vegetable Peeler. Use On Fuzzy Or Slippery Skins. A Vegetable Peeler Made In Switzerland. Incredibly Sharp, Hardened Steel Blade.